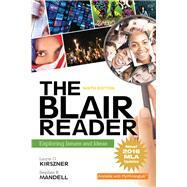 For students to write effectively, they must first read actively and critically—and The Blair Reader’s curated selection of readings supports this approach. Classic and contemporary selections stimulate discussion, encouraging students to discover new ideas and to view familiar ideas in new ways. The readings represent diverse ideas and genres; students will read essays, speeches, and short stories. Every selection is followed by questions to promote critical thinking and response about the reading and the theme, both to complement the readings and to support your instruction. Focus: Are “Tiger Mothers” Really Better? Focus: Is a College Education Worth the Money? Focus: How Free Should Free Speech Be? Focus: Why Are Zombies Invading Our Media? Focus: Do Racial Distinctions Still Matter? Focus: Is the American Dream Still Attainable? Focus: Is Every Worker Entitled to a Living Wage? Focus: What Has Happened to Academic Integrity?